Is the market for warehouse space supply constrained or simply not accessible? We look at the impact of utilising spare capacity within existing warehouses and the overall impact on the market for space. Nobody likes waste. 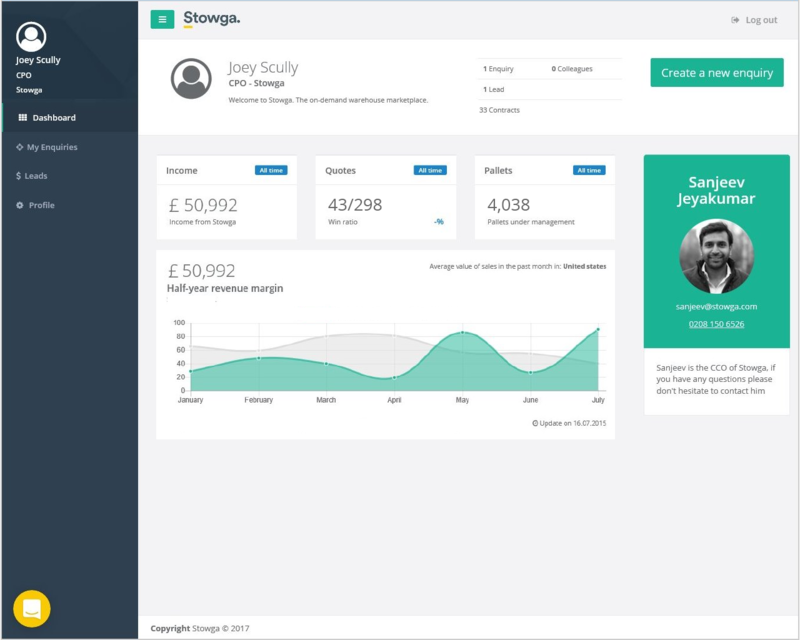 At Stowga we’re focused on using technology and data to find a solution to the problem of wasted warehouse space. Right now in the UK there is over 21 million sq ft of dedicated warehousing space sitting vacant, costing property owners a substantial amount of money. Unfortunately, this number is only really scratching the surface, as the data doesn’t fully include under-utilised space within industrial properties leased by businesses that is sitting idle. This makes the real number for “dead-space” in the UK much larger. Most corporates have to plan for dealing with “peak” storage capacity, which results in over-expenditure and leads to the significant under-utilisation of space within their warehouses. We’ve done some work on mapping the market and have calculated there to be approximately 2.1 billion sq ft of industrial space in the UK, with an estimated 5-7% vacancy rate. That means a tremendous amount of potential logistics capacity, which is currently wasted. In contrast, most of the media coverage in the logistics space focuses on the lack of availability of warehouse space and discusses how the market is supply constrained. 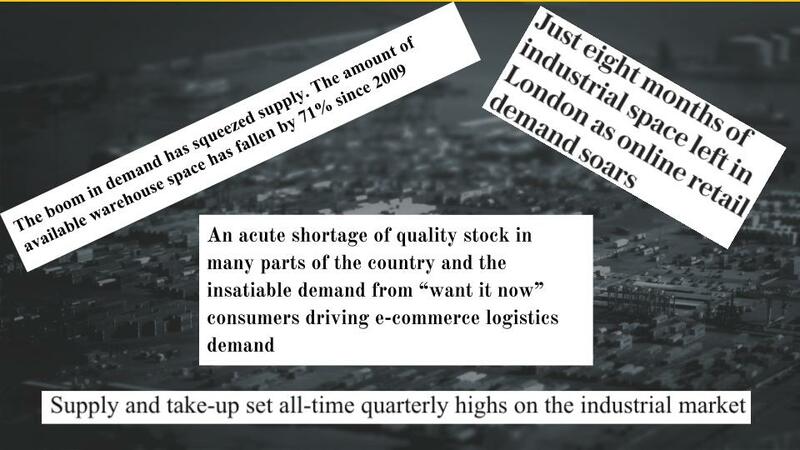 Large logistics and real estate firms are reporting a shortage in available industrial property supply across the country. They claim that supply is unable to keep up with huge demand driven by e-commerce retailers, which in 2016 represented a third of total demand for warehousing space. So what’s going on here? Too much empty space or lack of space? Which is it? The problem is not with the amount of available space, but with the visibility and utilisation of existing space. The market for warehousing in the UK is incredibly opaque and difficult to access, which results in these inefficiencies. As an owner of a warehouse, it’s difficult to market your space to the correct audience on a short-term basis, as there are significant marketing costs and overheads involved. As a customer, the lack of transparency in supply and pricing means that finding appropriate site can be challenging and time consuming. What’s the impact of this? On a micro-level, warehouse owners pay large fixed costs for unused empty space and for customers, the lack of accessible supply means higher prices. On a macro-level, the result is a higher overall cost of logistics and higher prices for all physical goods in the economy. This is what economists term “Market Failure” and it’s a huge problem that exists globally. So, what are we doing about it at Stowga? Well, our mission is very simple - “To Optimise Industrial Space”. We’ve built a Marketplace connecting customers to over 3,500 supplier sites with over 3 million available pallet spaces across the UK. These sites not only include warehouses, 3PL’s and logistics companies but also warehouses owned by multiple FTSE-100 retailers. These businesses have huge amounts of empty space within their warehouses and are looking to monetise their spare capacity. For customers we’ve digitised the process of looking for space so that hours and hours of phone calls can be replaced by a one stop solution for your business which collects your requirements and shortlists the best available quotes in a fraction of the usual time. We’re working with some of the largest industrial parks in Europe to design pallet capacity exchanges which make it seamless to trade space between sites at an industrial scale. The aim is to create an efficient market for space in a microcosm of the wider warehouse network. The exchange minimises the information barriers discussed above and supply and demand is matched at lower transaction cost, as space is traded amongst the members of the industrial park. In the same way Airbnb unlocked millions of underutilized residential spaces to be used for holiday lettings, we’ve unlocked millions of square feet that can be used for warehousing and logistics services. What’s the result of this? Bringing visibility and accessibility to this previously unavailable ‘grey-space’, results in a significantly more efficient allocation of supply and demand. Instead of being matched with the most visible space, customers are matched with the most cost-effective and appropriate supply which results in huge savings. Some of our existing clients have saved over 40% on logistics costs by finding suppliers through our marketplace. For suppliers, the result is increased resource utilization, with additional revenue that goes straight to the bottom line and an overall more profitable operation. Subscribe below to our great monthly newsletter with all the most important news from the world of warehousing and logistics.